Chipmunks are small rodents that belong to the squirrel family. 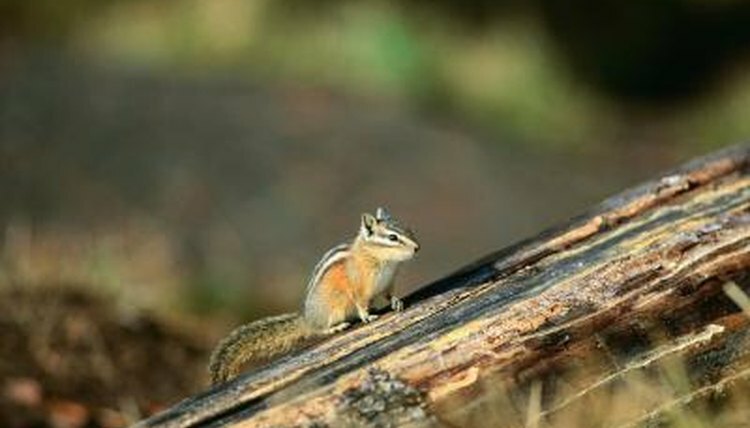 Chipmunks lack the big, bushy tail of a tree squirrel and are tinier than a ground squirrel. They are easily distinguished by the five dark stripes along the back, the center of which extends to the top of the head. Chipmunks are generally playful and harmless little animals that don't tend to cause the problems that other rodents sometimes do. There are 21 chipmunk species spread through much of North America, from where the treeline ends in northern Canada all the way down into parts of Mexico. There are no chipmunks to be found in the icy regions of northern Canada and Alaska, in the prairie regions of the Midwestern United States, or in the tropical and swampy areas along the gulf coast or the southern coastal states. They can typically be found in forests and woodsy areas, including city parks and backyards in wooded suburbs. They live alone in individual burrows, usually in areas where they can find rocks, bushes, fallen logs or other natural cover. Chipmunks are diurnal animals, meaning that they're active during the day and sleep at night. During warm months, they spend most of their waking time gathering food and storing it in their burrows. Chipmunks are known for their expansive cheek pouches in which they can carry large amounts of food. They hibernate in the winter, disappearing into their underground burrows to while away the winter with their large stores of food. Chipmunk mating season is in the spring, after hibernation ends. Eastern chipmunks often have a second mating season in the early summer, giving birth to two litters each year. After mating, the males and females go their separate ways, and females alone are involved in caring for their young after a gestation period of about 30 days. A newborn chipmunk litter usually consists of two to five naked and blind baby chipmunks who weigh in at about 3 grams each. At about 10 days old they begin to get hair, and at about 28 days old their ears open up. Their eyes open when they're about a month old, and they start being weaned onto solid food. After another two weeks, they're allowed to venture out of the burrow as their mother teaches them how to forage and gather food. Chipmunks grow up fast and have a very short childhood; they're only about 8 weeks old when their mother kicks them out of the burrow for good, leaving them to fend for themselves. What Is a Hamster Related To?